Losing a tooth is often considered one of the most devastating dental injuries. After all, not only is your oral health compromised (an increased risk of periodontal disease and additional tooth loss are common consequences), but your self-image suffers a blow too, making it difficult to even leave your house, much less interact with people in professional and social settings for fear of embarrassment. While traditional replacement solutions, such as dentures and bridges, are often available, many patients find themselves unsatisfied by their bulky, unnatural nature. While Drs. D’Amico and Mauck can’t rewind the clock and bring your lost teeth back, they do offer the next best thing at their Aurora office: dental implants. With the help of dental implants, our team can give you back the beautiful, seamless smile you’ve been dreaming of. Dental implants are small, titanium screws that fuse successfully with your jawbone tissue, effectively replicating the entire structure of your lost tooth. The process is simple – first, Dr. D’Amico and Dr. Mauck will refer you to a trusted oral surgeon; they will handle the placement of these screws. Then, once an appropriate amount of time has passed for you to heal, you’ll return to our Aurora office where we’ll place your brand-new, customized restorations atop them, completing the process. How are dental implants better than other tooth replacement treatments? 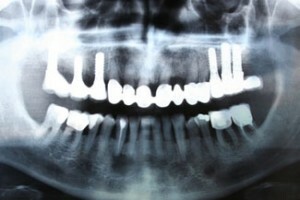 Dental implants are so effective because they replace the root of your tooth, not just the crown. While dentures and bridges often look nice, the lack of tooth roots will cause your jawbone to deteriorate over time, resulting in a hunched appearance for your face. Dental implants are the only restorative dentistry solution that provides a solution to this problem! Additionally, dental implants are much more sturdy, lifelike, and long-lasting than their tooth replacement counterparts. Don’t settle for an incomplete smile – instead, bolster your oral health with help from D’Amico and Mauck, DDS! Contact our office today to schedule an appointment. We welcome patients from all over the greater Denver area, including Aurora, Centennial, Englewood, Denver Tech Center, and beyond.